In a recent Q&A session, SAS Executive Vice President, Chief Operating Officer, Chief Technology Officer Oliver Schabenberger mentioned a thought-provoking concept. When learning (new) information, you should be able to convey it to three different people: a “newbie” (someone who has never heard of the information before), an expert (someone who is very knowledgeable of the concept) and a thought leader (someone pushing the concept past current boundaries). Therefore, it is my goal to provide you with three blog posts about our recent release of SAS Data Preparation, detailing the relevant information to talk to each of these three people. This is the first of the three-part blog series, starting at the most logical point to provide you with information that would be perfect to share with someone who has never heard of data preparation before (but is familiar with SAS; I will leave you to fill in the blanks here if need be!). 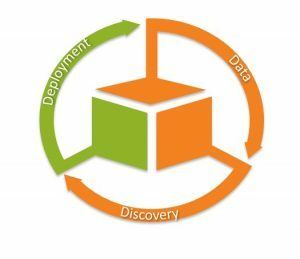 So what is data preparation? Data preparation is the task of manipulating data to then perform analysis or other business processes on it. SAS Data Preparation is software used for these ad hoc data management tasks. 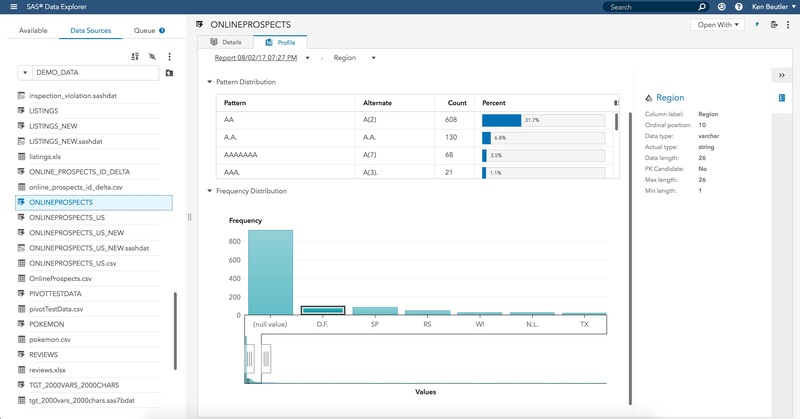 It runs on SAS® Viya® and contains two main elements that need to be conveyed to a newbie: Manage Data (loading and exploring information about the data) and Prepare Data (a canvas to play with and alter the data). In slightly more detail, Manage Data allows you to visualise data profiling [screenshot]– tables and graphs displaying information about the data in your table. You can also load and unload tables from memory (which is where they are stored to allow fast manipulation). Prepare Data allows you to perform changes to your data in a self-service, ad hoc manner to improve the quality of your data (e.g., one name for each person – only “Jack Jones” remains from the original “J. Jones” and “Jack Jones” within the table). Two other elements are also part of SAS Data Preparation: Organize Data Projects (a group workspace to share progress on a joint project) and Job Monitor (visualisation of all processes that have been run by SAS Data Preparation). However, these can be mentioned to answer subsequent questions, rather than explaining everything in one go. We don’t want SAS to look complicated! Within the analytics life cycle (pictured), as you can tell from the name, SAS Data Preparation helps users perform actions as part of the data phase, creating and providing high-quality data. Data is the foundation of any analytics strategy, and to get the most accurate answers to your questions, high-quality data is needed. Modernizing the Analytics Life Cycle includes speeding up supporting processes. Analytics agility demands intuitive data preparation. Tune in to this webinar to learn how. We all know that three is a magic number, so here are the three key features that a newbie should be made aware of! These three features all contribute to making SAS Data Preparation quick, easy and effective. Quick. Every window you open in SAS Viya has a similar and intuitive look and feel, making for a very quick learning experience of the software for all users. Easy. When performing the previously discussed data profiling with the use of the Quality Knowledge Base (QKB, explained below), data quality enhancements to your data are easily accessed and performed. Effective. You get every QKB country when licensing the product (previously, only one country was provided, with additional available for purchase). The QKB is a set of definitions (like a dictionary) that greatly increases the effectiveness of SAS Data Preparation and is SAS specific. Not only is SAS Data Preparation quick, easy and effective, but it is also designed for a wide range of users. Although the main foundation of the product is visual interaction with your data, coding users can also use the interface. This culminates in IT and business users working more efficiently together, creating an environment in which each can clearly see the needs of the other. Further increasing this collaborative element, processes created by a business user in an ad hoc manner can easily be scheduled and repeated by IT! However, for collaboration between the business and IT to be fully utilised, overarching governance is very important. Once SAS Data Preparation is being used, a company can start to reap the rewards of moving towards a data-driven approach to problem solving. Increasing the efficiency of everyone involved, resulting from processes becoming automated and scheduled, freeing up employees’ time to perform tasks that require their expertise, and providing an increased value to the business. All led by the high-quality and easily interpretable data your questions are being answered with. I'm always on the look out for self-improvement and challenging opportunities, allowing me to bring up-to-date information to customers with a fresh perspective. My interests include integrating new technologies to allow for easier and more efficient completion of tasks, and sharing this new learning with others. The whole is greater than the sum of its parts!